1. cake tray machine uses machine hand to clip paper, feeding paper, separate paper, punching, discharge etc. 2. Cake tray forming machine model can make different sizes of cake tray through changing mould. 3. Simple structure, inverter, auto temperature controller, easy to operate, high efficient, stable running. 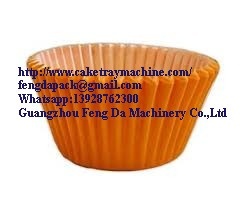 Cake tray making machine a ideal equipment of making paper cake trays, paper food trays, paper cake cups, paper food dishes, cake plates, cake dishes and containers etc. What is the product team? About 30 days before the ordinary machine 1-5 sets. Some States could accept L / C.
We can send you to design your country. Customers should not pay engineers and shipping.